Arthur Herbert Remington‘s early involvement with the Walking Picture trade is not easy to unravel. The earliest references are around the time of WW1 when he is known to have worked as a studio photographer in Greenwich and as a photographer at the Royal Naval College at Greenwich. He married Hettie Brooker in 1912 and had a son, Raymond, born in 1914 (Arthur and Hettie later divorced.) The earliest trade reference (1920/21) shows him at 20 Nelson Street, Greenwich, Kent. From there Arthur set out in the walking picture trade, and was soon operating as “Remington. A.H. (Fotosnaps)”, based at 55 Canterbury Road, Westonville, Margate (and also doing “Portrait and Commercial Photographs”). A little later he simply had “Fotosnaps, THE Photographer, Westonville, Margate” on the back of his walking pictures. Margate was a magnet for holiday makers from London and the South East, and Remington was there at the very start (he may also have set up businesses at Broadstairs and Brighton, this is unconfirmed.) The walking picture above is an early example from the 1920s. Sunbeam were the other big walking picture company active in the Margate area, but it is likely the two firms had an agreement to operate in different parts of the town’s extensive coastline. Other walkie firms were working in the area at the time; J. Easton covered Clifton Gardens, W.P. Dobbs the Clifton Baths, Walker’s Holiday Snaps at Marine Terrace (there in 1935 and 1936). And as with other firms, Remingon also took static portraits of people sat on the beach of in deck-chairs. One walkie I have shows the Remington Fotosnaps kiosk, a small wooden affair brightly painted in horizontal stripes so it would stand out. The photographer operated nearby on the seafront walk so it was easy to tell the prospective customer where to return later in the day to view the postcards. We have no information on how the business was structured, but it is probable that Arthur employed photographers and darkroom workers either on a full or part-time basis as did most walking picture firms at the time. Remington also took walking pictures on Hampstead Heath at some time in the Twenties, at The Spaniards, Hampstead. Some postcard walkies give both this and the Margate address on the back. The Spaniards is a historic pub and gardens on the edge of the heath (mentioned in Dickens), and a firm called the Brockwood Photo Co. was operating here before; Arthur Remington may simply have taken them over. Similarly Hove Holiday Snaps were later operated by Remington (from their former Davigdor Road address) in the Thirties. Remington was clearly a very good photographer himself; a series of wonderful hand coloured portraits of a child on the beach held at the V&A confirm this, looking like they might have been originals for a series of commercial seaside postcards (see above.). Remington’s Margate walkies are likely to have been taken on large glass plate negatives, each was marked by a unique reference number scratched into the corner after being developed (as on the one above), to match that on the customer’s ticket. It is very unlikely any of these negatives have survived. During the Thirties, Arthur developed The Remington Patent Roll Holder, which was reviewed in the British Journal of Photography in 1935. Adverts claimed Remington had made “over 300,000 exposures with the appliance last season” to test it. It was designed to fit on the back of the Thornton Pickard camera, and enabled the commercial user to load a reel of paper negative rather than the single slides or glass negatives it was originally designed for. It is thought Remington patented this, then sold the idea to Thornton Pickard. They launched a new camera called The Seaflex aimed at walking picture photographers and the new roll holder was a standard accessory. It could also be retro fitted to other models by the firm and Sunbeam were using these in the late Thirties. At some time Remington decided to move his operation to the Devon resort of Paignton. Perhaps there was simply too much competition in Margate. The latest Margate Remington card I have seen came from an album page annotated “Margate Holiday 1928” and he was working in Paignton by 1930, and walking picture cards give his head office address “for post orders” at Woodland Park, Paignton (see above.) This was a suburban villa and we assume he also lived there. Torquay was also listed on cards and some cards also list Teignmouth and Exmouth as having Remington outlets (though I have found no examples and these two locations didn’t last long). The firm were now known as Remington’s Photo Service. Remington’s address on the back of his Paignton walkies soon changed to Southfield Road (“South Mount”, Number 7), Paignton, South Devon (see below), though he kept the Woodland Park address for a time as “head office and works” but then dropped that. This posted example above is from 1938. We would assume it was from Paignton, except the text says “Do you remember Long having this taken in Torquay?” (Long being a family surname or nickname.) The card was then posted back to an address in Teignmouth from Glamorganshire! South Mount is a large Edwardian villa (see above, today), just round the corner from Woodland Park; this address was established at least by 1938 (the villa is still there albeit turned into flats and the gardens built on or turned into parking.) Arthur even went to South Africa in 1939 and tried to set up a photographic business there, but returned to Paignton just before the outbreak of WW2. By then he had invested in one or more Leica 250 35mm Reporter cameras for his walking picture business. By this time Remington’s Photo Service was a limited company, and the name began appearing in local directories in 1946. As at Paignton, Torquay had seen walkie firms come and go and there were other firms working there before or at the same time as Remington (Turner’s Happy Snaps in the Fifties, Kine Snaps, there in 1931.) Examples of Remington cards from the town are however much less numerous. He appears to have begun supplying postcard prints as in Paignton (with the firm’s name right across the back to avoid the extra tax on a postcard which could be written on, see example below from 1939), but soon moved to smaller more modern size prints with no name on the back, which makes them hard to identify. I have seen two walking pictures of service personnel taken in Torquay in 1941 and 1943 which suggests Arthur had been able to secure enough supplies to carry on the business perhaps in a reduced capacity (many walking picture firms closed with the outbreak of war, unable to get materials or because piers and other seaside attractions were closed by the military Soldiers and airmen on leave were good subjects for walking pictures. Arthur died in 1965 at the Holly Bank Nursing Home, although the business was still listed in the local directory until 1967. 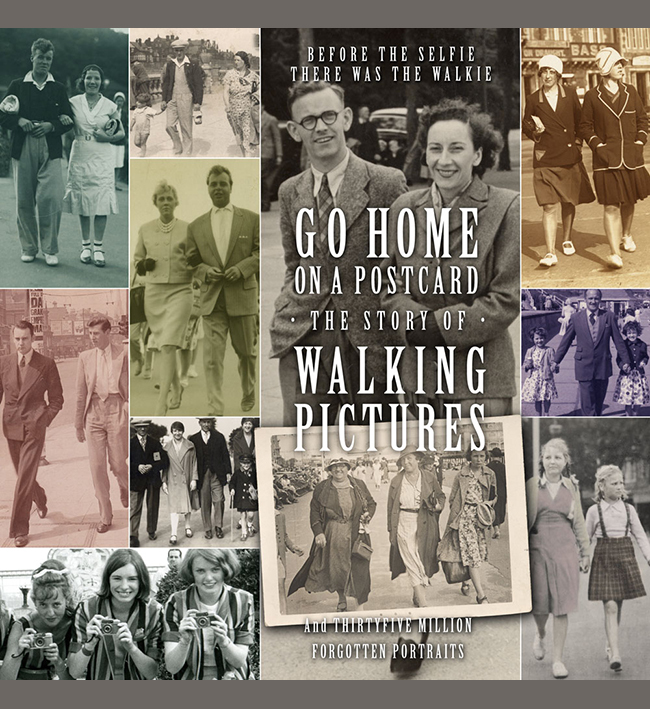 He and his firm left a legacy of around thirty years worth of walking pictures (which could well number over a million prints), many of which are of excellent quality and probably still feature in photo albums across the country. Note : Paul Godfrey has confirmed that Arthur’s son Raymond took after his father and also took walking pictures for a time, from “Remingtons Head Office, Wylie House, Alphington Road, Exeter. Phone 54595,” his mother’s home (Raymond was killed during WW2.). Thanks to Colin Harding, Paul Godfrey, John Tucker, Sarah Norris. If you can help with any further information about the firm or family, worked for them in the Fifties, or have examples of Remington cards, please get in touch. This article is intended to focus on the history of the firm, The illustrations have been sourced on the internet and are not from the Easy On The Eye archive. More examples of Remington’s work are featured in the book Go Home On A Postcard.